Well we finished packing our bags and made our way to Flagstaff, AZ for the 107th annual AAVSO meeting which was held at the historic Lowell Observatory. 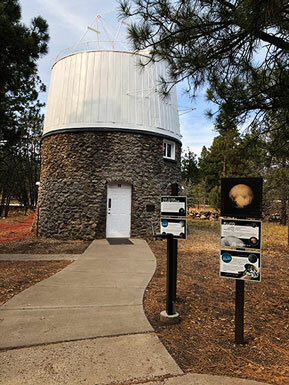 Lowell Observatory is located just a couple of miles from downtown Flagstaff and is at about 6900 feet elevation in the forest and the weather forecast was much colder than here in Orange County. 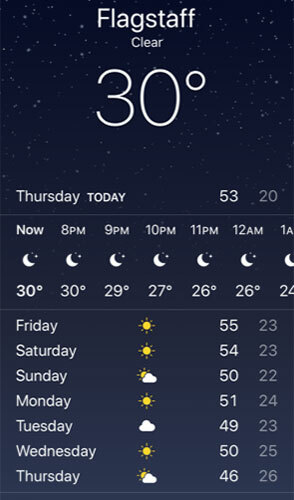 While our high/ low expected temperatures were 70/50 degrees, in Flagstaff the forecast was for 50/20 degrees, so that the low temperature we were getting used to was now going to the high temperature. Check out the forecast screenshot below. Brrr, that is cold but at least we packed our super heavy winter clothing! 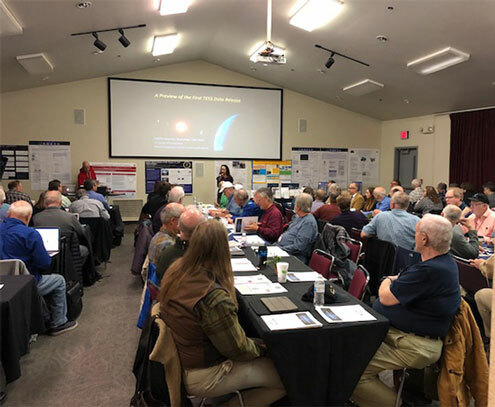 So about a hundred American Association of Variable Star Observers (AAVSO) members settled in for 2-3 days of presentations and discussions and a tour of the observatory and a night of observing at some of the historic telescopes. There is just enough space here to mention just a couple of interesting topics. First, Dr. Jessie Christianson talked about the coming online catalogs of TESS light curves and how AAVSO trained volunteers can help. This is her second appearance explaining how amateur support though AAVSO was needed in order to mitigate the risk of false positive identification of exoplanet candidates. The issue, as described in the earlier post of June 16, 2018, is that TESS has a very wide 24 degree field of view and a pixel size that sometimes is too small and is subject to false positive indication of an exoplanet. One example is when a binary eclipsing star is dim and far enough away that the light from that pair fails mostly on just one pixel In this case the dip in the light curve is not indicative of an exoplanet candidate. It is instances like this, and other false positive signals, that require much more analysis and in this particular case it can be resolved by AAVSO members training their narrower field of view scopes on the target star and seeing if it is a true exoplanet case or just an example of an eclipsing binary star. 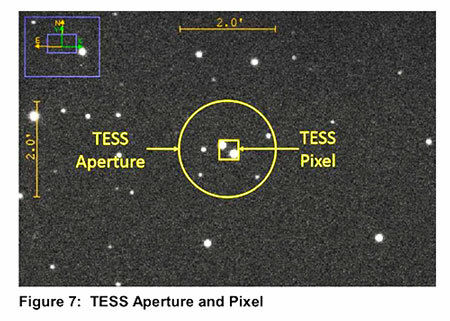 See the image below where the TESS pixel size is overlaid on an AAVSO small scope image. Now not all of the news occurred during the official presentations and during one of the coffee breaks, many of us went outside to get some more of the fresh, but cold, mountain air, when we were amazed to see a strange reflection of sun light in the sky. So we all got out our smartphones and started taking pictures like the one shown below. I guess the high cold air with some ice crystals present causes some reflections like this. In this image I tried to capture get a little bit of the sun coming over the roof so that its position relattive to the reflection could be identified. The arc bends away from the sun. 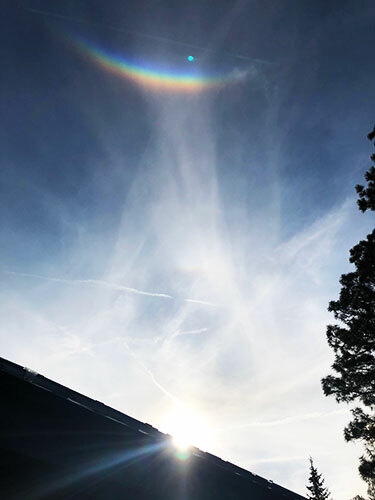 It is not quite a sundog and I later learned that this "upside down rainbow" is called a circumzenith arc and is typically about 46 degrees away from the sun, while sundogs are about 22 degrees away from the sun. You can also see some iPhone lens flare as a little blue dot. Another interesting topic was how optical interferometry, just like the case of radio interferometry, like that at the Very Large Array (VLA) radio telescope, is capable of showing very large increased resolution at optical wavelengths. The optical resolution increases with the diameter of the telescope mirror, but it is impossible to build a mire kilometers in diameter. To get the higher resolution the phase delay between incoming wavefronts must be adjusted between all the telescopes in the array to arrive mostly at the same time at the camera or sensor. Dr. Gerard van Belle, Lowell Observatory, described the ongoing development and upgrade of the Navy Precision Optical Interferometer (NPOI), which is associated with Lowell Observatory, but located on another mountain about 16 miles southeast of Flagstaff. 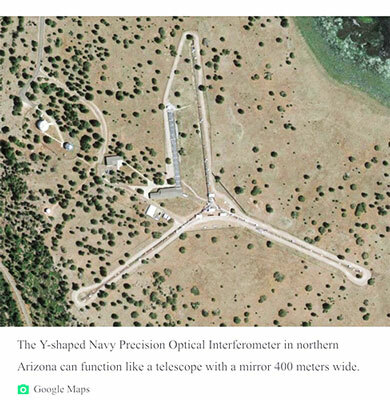 The present configuration of the Y arrangement of three telescopes fits in a 400 meter diameter circle. He presented some interesting images where in one case the target star was spinning so fast that its shape was distorted from spherical to more oblate shape ad the interferometer image showed this. Pretty neat! We will have to follow up on optical interferometry in the future. 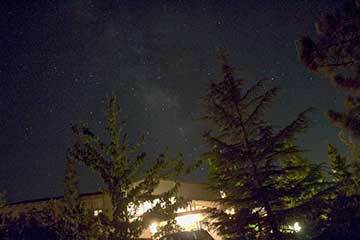 Finally, during one of the breaks, I walked up to see some of the other domes at Lowell Observatory. When we finally get our more official tour where they open all the doors we will be able to report back on that. In the meantime, we have to just wait at the outside, like at the Pluto dome, until we can go inside and hopefully put own eyeballs on the scope where Pluto was first discovered.